A mini-browser. 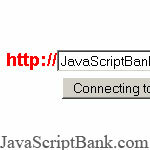 You can type a URL in the form and script will load the requested page. The script works in both Netscape 4.0+ and IE 4.0+, but best in IE. java is a great invention of programing. I love to use this code. Is this work in Google Chorome ? I tried it on firefox but it seems that there is a problem. Do I have to switch to IE?? what the problem you face? I have enjoyed the scripts I have found here! Looks like a very close idea to creating a self-owned proxy site. Thought it was scripted with iFrame but I think it is nowhere coded with that, am i correct? Great little script thank you very much! !